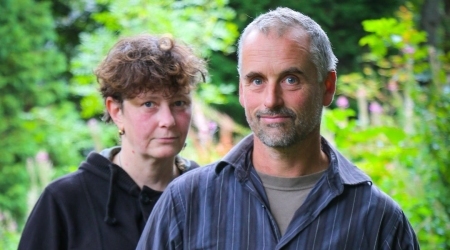 Cath & Phil Tyler play Anglo-American folk music using guitar, banjo, voice and fiddle. Cath was a member of the band Cordelia’s Dad in the 1990s when she lived in Massachusetts, USA. Phil, from Newcastle upon Tyne has played in various folk, rock and ceilidh bands for many years. Coming together musically through a shared love of traditional narrative song, full voiced sacred harp singing and sparse mountain banjo, they have performed on stages as diverse as the Royal Opera House in London and a dank tower in the old city walls of Newcastle. Taking a more minimal approach to their material than some, they have been described as ‘one of the most compelling musical partnerships on the scene’, their music being ‘a highly concentrated and intimate musical experience that penetrates to the very rawest essence of folk tradition’.